Jack O'Keefe's Super Crispy Trout with Chorizo, Cherry Tomatoes, and Rocket. Place a good non-stick frying pan on a high heat. Dust the trout with a little sea salt. When the pan is hot add roughly 2 tbsp of oil to the pan followed by the trout skin side down first. Turn the heat down to medium, add the chorizo and cook for five minutes along with the trout. While the trout and chorizo are in the pan add the tomatoes to a bowl along with the lemon juice and zest, honey and a pinch of salt and pepper. Toss well. Once the skin is crisp turn the trout over for a minute and remove. Toss in the contents of the bowl and shake the pan. Remove from the heat and add the rocket to the pan at the last minute. 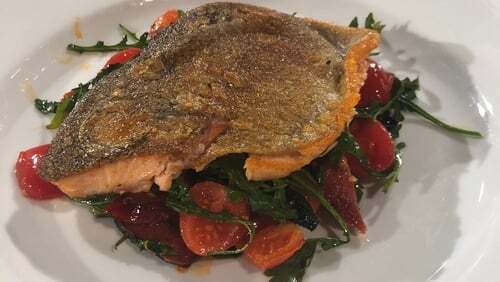 Place a scoop of the tomato mix into the centre of the plate and place the trout on top.